As my kids get older, the amount of time I have to cook dinner seems to be less and less. Ok, who am I kidding. It doesn’t seem to be less. It actually is less. A whole lot less. Between Spanish classes, Y-Guides and Faith formation, our afternoons are filled with the kids and me shuttling around in the car, racing to make the next destination on time. Dinner is a far thought in the back of my mind. I remember the days when I had all afternoon to think about and prepare a tasty meal. I would plan and orchestrate without interruption and the result was usually a masterpiece fit for a king (or at least a family of five). Today I’m lucky if I walk in the door at 5pm and have even had the foresight to pull out a package of meat for that night’s meal. Enter in my trusty slow cooker. This past weekend Scott took me out to a nice dinner, just the two of us, to celebrate my birthday. We enjoyed a thoroughly delicious Greek inspired meal, as well as each other, with no kids for the first time since our trip to New York last August. It’s amazing how when you spend so much time being parents, once you finally are given the opportunity to be a couple again, you’re not quite sure how to handle it. Sometimes finding topics to talk about other than the kids can be a challenge. I, however, being the mom to three boys that I am, quickly remedied that problem with a drink called a cream soda; and no I’m not talking about the old time soda shop cream soda. It was a mixture of Absolut Vanilia and Ginger Ale. And let me tell ya, I’ll take that version of cream soda any day of the week. It was a bit like going back to that fated soda shop only the shop keeper decided to spike my soda with something warm and fuzzy. Thank you very much Mr. shop keeper. Not to mention how adult it is; an absolute reminder that behind that rather expansive curtain of parenthood, Scott and I are indeed still a married couple at heart. Yep, that’s right, I’m doing an appetizer tonight. Hey, it’s easy and yummy, and a perfect recipe to post after a long day spent on an 8 hour round trip bus ride and zoo trip with 6 different classrooms worth of kindergartners. I’m tired, I’m sore, and I’m mentally spent. Yea, we had a blast. No really, we did! Nicholas said his favorite part was getting to see the tiger roar. 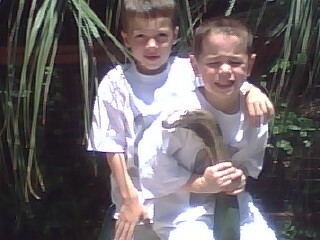 Here is a picture of Nick and his buddy Cole posing on top of a dinosaur. Forgive the picture quality; it was taken from my cell phone. I really wanted to take my good camera, but I figured me wandering off to shoot pictures of the animals and scenery while the kids roamed aimlessly in circles saying “are you done taking pictures yet?” might not go over so well. To put this dip together, pull out your food processor and throw in your salmon and cream cheese. Turn it on and mix it until it’s smooth. Now add in your onion, lemon, liquid smoke, garlic, and dill. Process again until smooth. Now all that’s left to do is take a taste and add your salt and pepper according to your liking. And voila. I told you it was simple. What’s that? You didn’t hear what I said? You’re too busy eating? What do you mean I can’t have a cracker and some of your dip? I see my job here is done. I hope everyone has a great weekend! Pull out your food processor and throw in your salmon and cream cheese. Turn it on and mix it until it's smooth. Add in your onion, lemon, liquid smoke, garlic, and dill. Process again until smooth. Salt and pepper according to your liking.